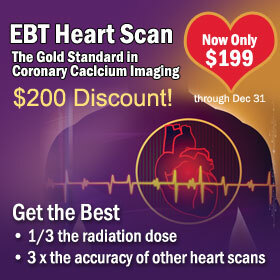 EBT Heart Scan » Why Early Detection? If conventional risk factors worked, it would be logical to assume that annual coronary deaths would be going down. They are not. Individuals who are actually at high risk most often seem healthy. Pass a Stress Test or Treadmill Test. 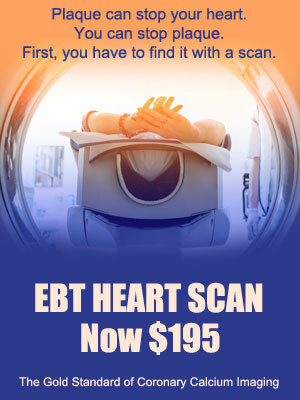 EBT heart scans provide an early warning system. For over 65% of Americans, the first and only sign of heart disease is a fatal heart attack. EBT heart scans are able to find coronary calcium, or plaque, at very early stages, long before an event happens or surgical intervention is needed. At these early stages sometimes all that is needed is small modifications in diet and/or exercise and proper nutritional supplements. Early detection leads to better outcomes. The earlier plaque, heart disease, atherosclerosis is detected, the greater chance it can be slowed, stopped or possibly even reversed. Yes, reversed.